You can see the International Space Station and other Earth satellites in the night sky. No telescope or binoculars are needed. You only need to know where and when to look. The space station looks like a bright, fast-flying airplane, but without any blinking or colored lights. It can be as bright as the planet Venus and is easily visible, even in lit-up city skies. The Space Shuttle is also easily visible. During most of the night, satellites fly in the dark and are therefore invisible against the dark sky. During the day, the bright blue sky obscures the view any satellite. However, for an hour or two after sunset and and hour or two before sunrise, the sky is dark, but high-flying satellites are lit up by the Sun and visible against the dark night sky. You can see the part of the Earth that is lit up by the Sun (daytime) and shaded where it is not lit up (nighttime). The white line shows the path of the ISS over the earth, with the current position marked in the center with the little model of the space station. Where the white line is solid, the ISS is lit up by the sun. 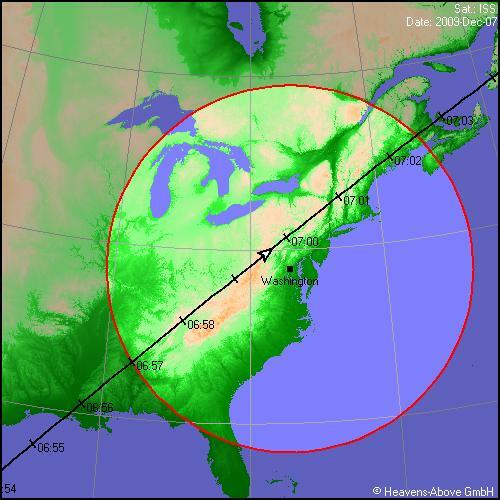 Where the white lined is dotted, the ISS is in darkness. The ISS can be seen from the ground only where the white line is solid but in the shaded portion of the Earth, in other words, when the ISS is lit up by the Sun at night, shortly after sunset or before sunrise. This picture at the Heavens Above home page is updated each time you open or refresh the page. To determine when there are viewing opportunities, you need to enter your current location. From the Heavens Above home page, under Configuration, click "select from database," then select your country name and enter your city name. Then select your city from the list of matching names. This takes you back to the home page with your city name, latitude, and longitude shown under Configuration. The table shows the viewing date, the maximum brightness magnitude, the starting time, the maximum-altitude time (when the ISS is the highest above the horizon), and the ending time. The listed times are for your local time zone, including daylight savings time, if applicable. These are 24-hour clock times, so 17:03 means 5:03 PM and 6:14 means 6:14 AM. The table also shows you where to look: W for west, SE for southeast, and so on. The magnitude indicates the relative brightness, with smaller or more negative numbers representing greater brightness. As a measure of comparison, the brightest planet, Venus, has a magnitude of -4.4 and the brightest star, Sirius, has a magnitude of -1.4. The North Star, Polaris, has a magnitude of 2.0. This map tells you exactly where to look in relation to the constellations, planets, and Moon. You might find the position of East and West on the map confusing at first. Remember, this is a map of the sky, not the ground. If you print out the map, hold it above your head, and point the North end toward the North, East and West fall into place where you expect. You can see the ISS only when it is inside the red circle. In this example, the ISS rises above the horizon at 6:57 AM, passes nearly overhead at 7:00 AM, and then sets on the horizon just after 7:02 AM. A great time to view the ISS is shortly before docking with the space shuttle, or after undocking. If you're lucky, you can see both spacecraft at the same time with a slight separation in the sky. Chris Peat's Heavens Above web site is the best source for information about viewing the International Space Station and other satellites, even better than NASA's own SkyWatch web page. You can help support the Heavens Above web site by viewing any sponsor ads there that interest you.